Forcing bulbs indoors is a fun and satisfying winter project. However, many bulbs require a chilling period in order to root; usually between 12-15 weeks. Then you’d need an additional three weeks or so, to stimulate flowering. So, at best, we’re talking about four months. Fortunately, a few choices don’t require the long chilling period necessary for most bulbs. One great option is Paperwhites (Narcissus tazetta). These bulbs are easy to start, and you can have indoor blooms in just a matter of weeks. Available in your local garden centers in early fall, Paperwhites are most easily potted in shallow containers of gravel. Place the bulbs on a gravel layer, adding enough gravel to hold the bulbs securely in place without covering them completely. For a fuller look, don’t be afraid to pack the bulbs close together in a crowed grouping without touching each other. Add water to the container, just up to the base of the bulb, without touching it. Place the container in a sunny spot, and in a couple of days, you’ll see roots forming. Maintain the water at this level and rotate the container every several days to keep the stems growing upright. In three to five weeks, you’ll have beautiful fragrant flowers. 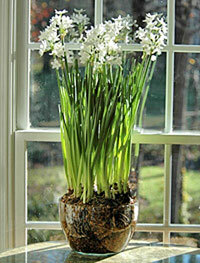 You can even have Paperwhites in bloom from Thanksgiving to March if planted several weeks in succession.